A young man forced into action. A juvenile dragon alone in a new world. Whispers of a terrible evil returning to power. Nineteen-year-old Anders lived a fairly normal life until the only family he had was taken away from him. When he finds himself forced to embark on an action packed adventure, he discovers there is more to the world than he was told. The magical force that flows within everything around him becomes revealed. Dragons, elves, orcs, and goblins lurk around nearly every turn along the path as he pursues his two kidnapped cousins. As Anders discovers more about his family’s past, he learns of their involvement in The War of The Magicians and the circumstances leading up to the attack of his hometown. When Anders is told about his potential involvement in a prophecy involving dragons and their powerful magic, he will need to make a difficult decision. Will he continue to follow the path that is laid out for him or can he make his own destiny? Will he ever be reunited with his family again? And if he succeeds, will he ever be able to return to the life he once knew? 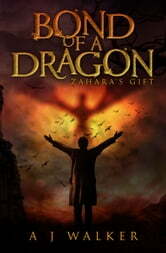 Bond of a Dragon: Zahara’s Gift is the first book in an adventure fantasy series. If you like fast-paced adventure novels, fierce dragons, powerful magic, and a hero fighting for justice, then you’ll love the fantastic starter in AJ Walker’s new page turning series. Unlock Bond of a Dragon: Zahara’s Gift to embark on this great adventure today!